Today I'd like to talk about ACCOUNTABILITY in the financial industry. I have read a couple disturbing articles lately and I would just like to provide a perspective from the outside looking in. Everyone seems to be well aware that we are in a financial crisis, except the financial industry? In an article by Corky Siemaszko of NYDailyNews , Jamie Dimon, CEO of JP Morgan, is humiliated by the President of France, Nicolas Sarkozy at the World Economic Forum in Davos Switzerland. Dimon defends his dear banking industry by calling Sarkozy's criticism "unproductive and unfair." Are you kidding me? This sounds like a school yard defense. Instead of owning up to the fact that they created a monster paper derivative market that has no home for its HUNDREDS of TRILLIONS of dollars in numerical value, and suggesting a solution, Dimon says it's "UNFAIR." What's unfair is the multi-million dollar bonuses some CEO's got for failing! Dimon also has the gall to ask for more FLEXIBLE regulations in banking? It's like a kid in a candy store complaining, the store is not big enough. NO Accountability! Then, in an article from Advisor.ca, we have Don Reed, the CEO of Franklin Templeton, one of the largest mutual fund companies in America, questioning the intelligence and character of Canadians because "his company's survey" found that many Canadians are still "suspicious" of the market? Maybe someone should introduce this guy to Bernie Madoff? Mr.Reed goes on to say that he doesn't understand how the markets have recovered dramatically, yet investor confidence has not? His company spent two years studying investor's attitudes towards markets, maybe they should have been studying the "MARKETS" instead! Again, it seems that these CEO financial types live in their own world and they are NOT ACCOUNTABLE for anything? The most disturbing thing is, that all these bankers and financial paper pushers are the first in line to criticize Gold and Silver as an investment. Why? Because Gold and Silver are honest money and they reveal the true nature and condition of the financial industry. Gold and Silver cannot be created out of thin air. Gold has been considered money longer than ANY bank, stock market or currency has ever existed. Gold has shown its true colors over the past eleven years, along with Silver, as the best performing assets in the entire industry. 5000 years of history prove that Gold is the ULTIMATE currency! Folks, the financial system is broken and all the bankers and politicians are just patching things up like a handyman with duct tape. Until we get someone to professionally analyze the problem and come up with a solution to replace the broken parts, we will see Gold and Silver go much higher and there will be more civil unrest around the world. It happens time and time again throughout all of history, politicians and bankers push their limits until something SNAPS and a war breaks out. Egypt anyone? Grocery prices increased at more than 50 percent the rate of inflation in 2010, according to data from the U.S. Bureau of Labor Statistics. Food prices increased an average of 1.7 percent between November 2009 and November 2010, in comparison with a general inflation rate of only 1.1 percent. The greatest price increases were seen among meat, poultry, fish and eggs, which went up in cost by 5.8 percent. The price of sugar and sweets increased 1.2 percent, the price of fats and oils increased 3 percent and the price of dairy-based products increased 3.8 percent. The only commodities to go up in price more than food were medical care and transportation. HOW I WOULD INVEST A $100,000 WINDFALL: I would probably put 80% in precious metals, 10% in energy, and another 10% in agriculture, as well as special situations stocks. Here is a link to a very thoughtful article by a very respected and honorable individual. Not only does he address the current financial crisis, but provides a workable solution to the problem, which very few are bold enough to suggest. CHINA, the Next Global Super Power? Is Alan Greenspan Returning to His Golden Roots? Something stinks to high heaven here? Last week Mr. Geithner asks Congress to raise the ceiling on the government debt, now he's warning of another crash? There seems to be no end in sight to the debt problems and yet "The Market" is still in rally mode and Gold is less than $2,500? Here we have the Treasury Secretary of the USA asking Congress to raise the debt limit of the government? Is this a sign of a healthy economy in recovery? Has more debt become the solution for debt? With over 44 years of investment experience and one of the most respected technical analysts of global markets, Robin Griffiths is not someone to ignore. Many have said the definition of "insanity", is doing the same thing over-and-over again and expecting different results. I guess Robin is referring to the gold bears who have been dead wrong for the past TEN years! JW: My views haven't changed since we last talked. The ultimate result here is the government printing money to meet its obligations. The Fed effectively is funding the government's borrowing. But as the economy continues to weaken, as the deficit worsens, as the Treasury funding needs increase, quantitative easing and monetization of U.S. Treasuries will have to increase. We're going to see more and more foreign holders of dollars sell their dollars. I think there's high risk in the next year of a panicked sell-off, a panicked dumping of USD-denominated paper assets. All of that will cause the Fed to continue to flood the system with liquidity, to buy up unwanted Treasury debt and stimulate inflation. As people increasingly don't want to hold the currency because of the inflation, we'll start to see higher inflation that quickly can evolve into hyperinflation. 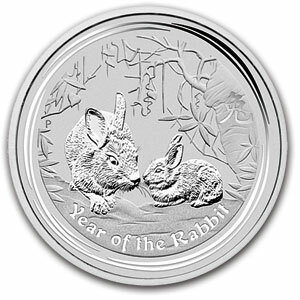 We have ten 1kg Silver Lunar Rabbits on order and due to arrive in our warehouse in 2 weeks. Please book your order now if you're interested. Classic Bob Chapman, Tells it Like it IS! If you look back into the mid-1960s you will see the beginnings of today’s financial and economic problems. Inflation was beginning to raise its ugly head as clad coins came into being. We were collecting all the pre-1964 90% dimes, quarters and halves we could find. As we moved into 1968 few were to be found in circulation. War in Vietnam was draining the country and the buffoon Lyndon Johnson, another socialist, was leading America into the Great Society. What he was really doing was taking the US into socialism and debt. It got so bad that countries were demanding gold for dollars, particularly, aggressive was President Charles DeGaulle of France. Then the beginning of the end came. On August 15, 1971 the dollar was moved off the gold standard and the dollar became just another fiat currency. Here we are almost 40 years later and the dollar has lost 95% of its purchasing power and two breadwinners are needed in every family, as apposed to one in 1971. That is when social engineering began, as we know it today. We’ve seen many losers walk across the stage over the years – all with either their hands in the till or exuding incompetence. Most of the bright still excelled but 55% of Americans slipped into stupidity. What is sadder is they think they know it all, but they do not. From 1976 to 1981 gold and silver warned us of what was coming. We have had cycles of inflation, buildup of debt and a general degeneration of society.